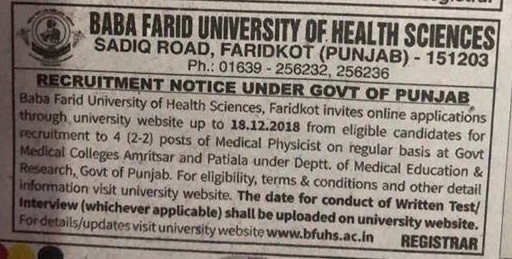 Online applications are invited by Baba Farid University of Health Sciences – BFUHS Recruitment 2018. Interested candidates for BFUHS Recruitment 2018 of Medical Physicist Jobs. Candidates Can Apply Through the Official Website www.bfuhs.ac.in Both Male and Female Can Apply Online For BFUHS Recruitment 2018. The Candidate Should have M.Sc. in Medical Physics from reputed universities. Salary Package Details will Shortly Available.